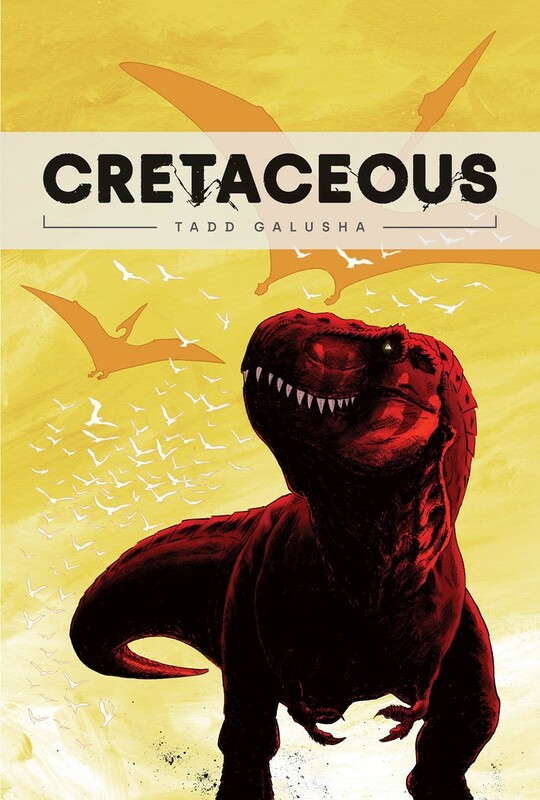 Explore a family of dinosaurs in Tadd Galusha's middle reader graphic novel CRETACEOUS. Media Release -- Tadd Galusha (TMNT/Ghostbusters 2) is taking a step back in time with his latest release, Cretaceous. On March 27th, Oni Press brings you an all-new original graphic novel for middle readers that's a dinosaur of a "tail," with illustrations that'll make you feel right at home in the majestic and brutal Cretaceous Period. When a Tyrannosaurus Rex is separated from its family unit, it embarks on a harrowing journey to reunite with them before the raw, real dangers of the Cretaceous Period separate them for good. This heart-wrenching story takes to the skies and dives into the sea—and explores everywhere in between—in this research-based, fictional account written and illustrated by Tadd Galusha. "Dinosaurs were such amazing and startling creatures," said Tadd Galusha. "I've always imagined their lives played out as these visceral and turbulent, day-to-day epics across a harsh and unforgiving landscape disguised by nature's splendor. Tadd Galusha will be signing copies of Cretaceous at Bosco's Comics, Cards, and Games (2301 Spenard Rd. Anchorage, AK) on March 16th from 11am-5pm. Oni Press is a premier comic book and graphic novel publisher located in Portland, Oregon. Founded in 1997, Oni Press is run by Founder Joe Nozemack and Publisher James Lucas Jones. Oni Press's curated line includes a variety of best-selling, award-winning, original and licensed comic books and graphic novels, including: [adult swim]'s Rick and Morty, Nickelodeon's Invader ZIM, Scott Pilgrim, The Tea Dragon Society, Queen & Country, Courtney Crumrin, My Boyfriend is a Bear, The Sixth Gun, Sci-Fu, Wet Moon, Letter 44, The Coldest City, and Kaijumax.